Congratulations to Stijn Debackere and Eduardo Pavinato Olimpio with winning the 2015 Hendrik Casimir Prize! Stijn is a MSc student of the Physics/Cosmology track at Leiden University. He has made a switch from Theory to Cosmology. In the first year of his MSc he has completed more than the nominal 1 year credits, has taken the long versions of the mandatory courses, and scored above 8.0 on all his courses with several between 9 and 10. Currently, he is working on a project in Cosmology that spans theory, data analysis, and numerical modelling. 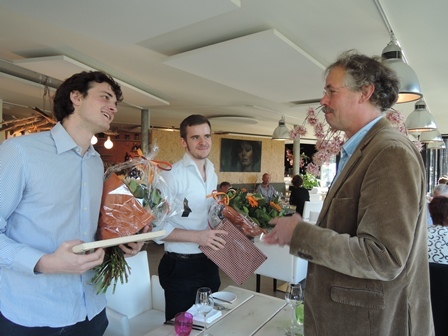 On Friday December 4th, Jan van Ruitenbeek, Scientific Director of Casimir, awarded the prize to Eduardo and Stijn. 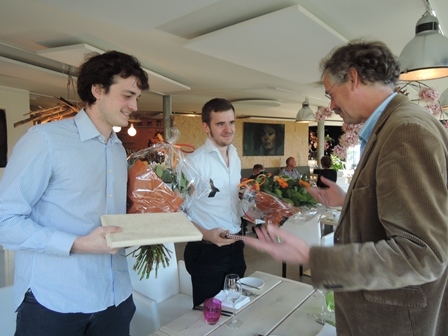 The Casimir Research School yearly awards the Hendrik Casimir Prize to the best MSc students in (Applied) Physics at Leiden and Delft. The prize consists of a certificate and a sum of € 750.- . The prize is based on the revenues from a donation by the late Josina Casimir-Jonker, wife of the famous Hendrik Casimir. The students are nominated by a committee formed by Jos Thijssen (director of Master Education Delft), Martin van Exter (Director of Education Leiden), Hara Papathanassiou (study advisor Leiden) and Christophe Danelon (coordinator of the Casmir pre-PhD Master program in Delft).